What an exciting week ahead!!! 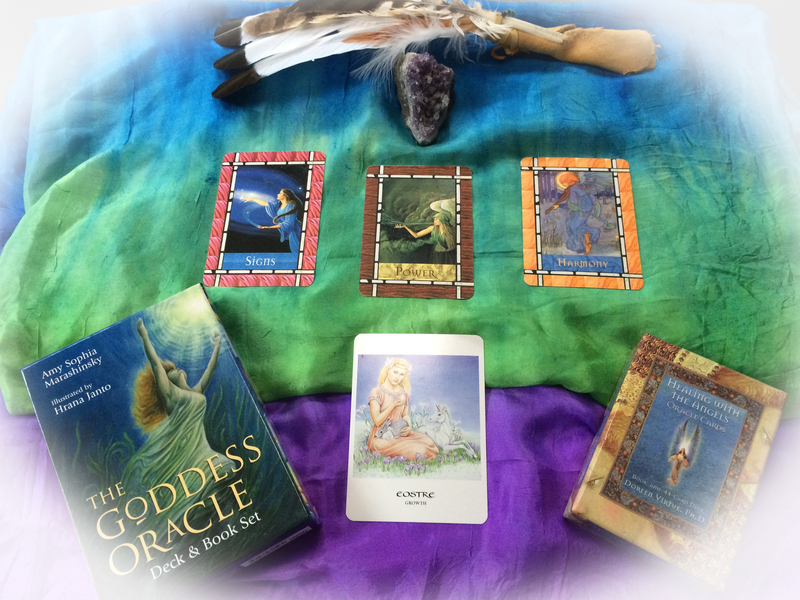 Today I am mixing it up a bit as I was guided and instead of just pulling 3 cards for the week I have pulled a forth card which is our guiding force. She is all about new growth and rebirth. How fitting that she guides us right after the Spring Equinox & the New Moon Total Eclipse. She is all about movement forward and expanding and enhancing all that is possible!!!! She comes forward with the message of personal growth and opening yourself up to all the possibilities! Is there a class you have been wanting to take or has an opportunity come across for you to expand your knowledge with a new mentor? DO IT!!!! This is the perfect time to let go of stagnation and expand into growth!!! It’s time to start stretching those muscles!!! It is time to nurture yourself and embrace the experiences coming your way…and this week, they ARE coming!!! Monday – Tuesday is the card “Signs”. Pay careful attention as the Angels are giving you signs that you have asked for! Have you been praying for help in a situation? Have you asked for evidence of their help? This card is telling you that Your Angels are trying to get your attention. I personally see butterflies when my Angels are around or I’ll see birds that do unusual things around me. Are you questioning what path you should take and the action set you should start, then pay attention to the signs. It could be something like seeing the same commercial playing everywhere you go. It’s on the TV, it’s on the radio, you see the print ad. If you see something that happens over and over again…It’s a sign! Trust your feelings on this one! Remember that your feelings are the spirit speaking to you! Remember to connect with spirit and ask yourself, ”How do I feel about this?” Be silent & listen for the answer. It will come to you as the signs are showing you the way and your spirit is the immortal divine spark of you & God. Wednesday – Thursday is the card “Power”. You are now allowing yourself to express that you are powerful and it is safe for you! Express your power with love! I love this! You have been Divinely blessed! You are the infinite power of Divine love, wisdom and intelligence available to you NOW!! It is time to take action steps!!!! You have been given in-spiration through spirit and now you are being guided to take the action steps needed to complete the task at hand. Have you decided to start a new project or a new company or a new way to accomplish a goal at work, when nothing else is working? Trust your instincts!!!! You are on the right path and you are safe!!! You are now tapping into the Universal Wisdom of the One Mind!!!! Your power is connected to that One Mind and of course you are getting signs…HELLO!!! Trust that you are on the right path! The angels ask that if you have any hesitations or fear that you hand it over to them. Remember that you ARE a powerful person and you ARE connected to the Infinite that You truly are!!!! I am so excited for you! Allow yourself to radiate out into the world in a miraculous way!!! This is your time to shine!!!! YEAHHHHHHHHHH! Friday & The Weekend is the card “Harmony”. Conflict is resolved in a situation that was troubling you. Know that you deserve this peace and happiness…so except it!!! What a wonderful way to end the week! Another sign for you in this wonderful sign filled week starting the new season of Spring! As a beloved child of God, you are a peaceful loving person by nature and this card comes to you as a sign of a new harmony in your life. It is time to view a situation that has bothered you in the past and release it!!!! I know that sometimes this is difficult to do. Our egos stand in our way so much and wants to hang on to “It’s point of view”. But how is that serving you? In truth, it does not and if you could just see that everything has actually 3 stories you would release it! Forgiveness is a gift for YOU!!! It releases you from negative energy and allows your spirit to soar and in doing so allows your abundance to flow to you without restriction. Miraculous things happen when you shift your point of view!!!! You elevate yourself to a higher vibration and miracles suddenly falling in your lap! What would you say if I told you are blocking your own success and it is your choice to release whatever is holding you back! Remember that each and every one of our lives is in our own control!!!! It’s all up to you what you choose! What is your choice? Harmony is yours for the taking! All you have to do is choose it!!! When you hold an elevated energy level your shift your perspective and suddenly all conflict drops away, revealing the wonderful new perspective that is a win-win situation for everyone!!!! Thank you all so much for following me and reading my blog!!! I am so grateful to be of service and it thrills me every day in every way to connect with all of my lovely friends!!! You are (to me) my new and expanded family and I love the unfolding!!!! I have updated my website in the Oracle Card Readings Section and I am now able to set appointments and take payments for personal readings!!! For my International family, we can Skype so no worries!!! I also will be recording these sessions so I can send them to you via MP3 recording. The energy will always find you and I in the same space and I am so grateful for the unfolding!!!! Today is going to be the best day ever!! !